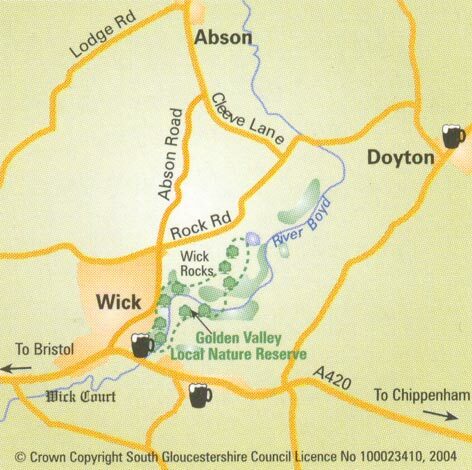 The reserve is in Wick, South Gloucestershire, and forms part of the Forest of Avon. The OS Grid reference is ST 706732. There are several access points. The most accessible is the main entrance via Golden Valley Road off the A420 (OS ref: ST 704729). Please keep to public and permissive footpaths when on the site. There are nearby bus stops for services from Bristol, Bath, Yate and surrounding villages. Please park at Wick Village Hall. There are two spaces at the Carpenters Arms for orange or blue badge holders. Click here for a detailed site map.